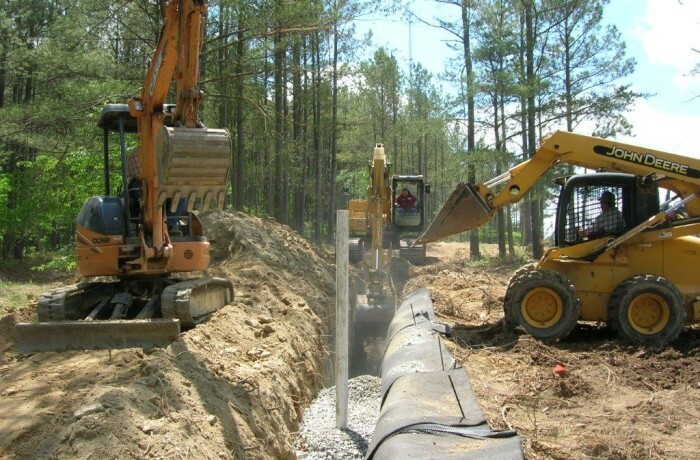 A methane abatement plan was needed for an Atlanta suburb landfill to meet EPA’s corrective action requirements to address high levels of methane gas around the facility perimeters. The landfill management was referred to and contracted with Mill Creek Environmental (MCE) for an abatement plan design, installation, and provide on-going methane monitoring services. MCE performed multiple test borings along with continuous split-spoon samples, soil description, blow counts and collecting other benchmarking data. An abatement plan was proposed and MCE recommended installing a methane interceptor trench between the waste cell and compliance boundary to limit the migration of subsurface methane gas and add additional methane monitoring wells. With the commissioner and board approval of the plan, MCE was contracted to manage the trench and monitoring well installation. An 18,000 square foot ditch was constructed and filled with a mixture of geocomposite material, native soil, and gravel which provided an added barrier to the perimeter. In addition, a system of over 30 methane monitoring wells and passive methane vents were installed to provide a barrier and monitoring means. Once construction was complete, Mill Creek Environmental performed the methane monitoring to ensure continuous compliance.